I’ve heard many good things about Squarespace. Such as how beautiful the templates are, and how flexible the platform is allowing you to create anything from a business website, online store, photography, or even a wedding website! Not being one to simply take other people’s word for it, I’ll be personally taking the platform apart piece-by-piece right here in this review to see for myself. 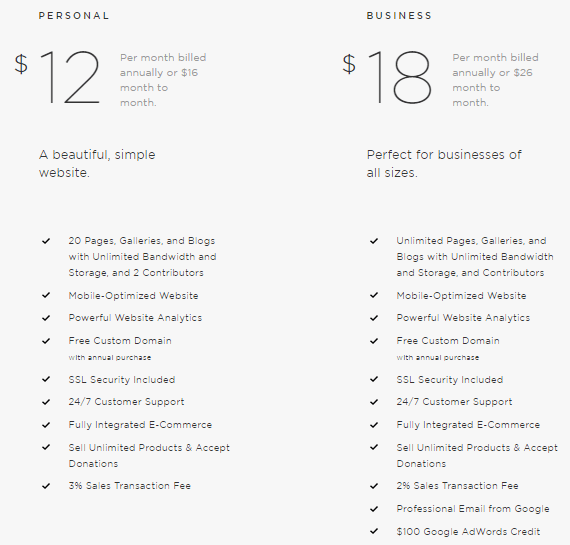 Want to stick around and see if Squarespace is a good fit for you and your business? Great, let’s get stuck in! 1) Some of the best quality design templates in the industry. 2) A plethora of website customization options. 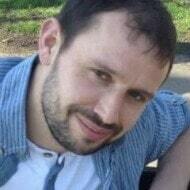 3) Fantastic help & support platform. 4) Full range eCommerce features available. 1) Slightly longer learning curve compared to some other website builders. 2) Business email address will cost extra if you don’t already have one. 2) No long-term free website option. Premium Plans: Ranging from $12 – $40 per month (when billed annually), monthly plans also available. Recommendation: People say Squarespace is for visual types such as artists and photographers and it definitely can be. But I can say with complete confidence that you can also build a beautiful looking website for your existing business or create an online store. Due to the steeper learning curve, some people who don’t have the time to learn it may become a little frustrated and a simpler platform such as Weebly or Wix may be a more suitable option. 1. Who Is Squarespace For? 2. 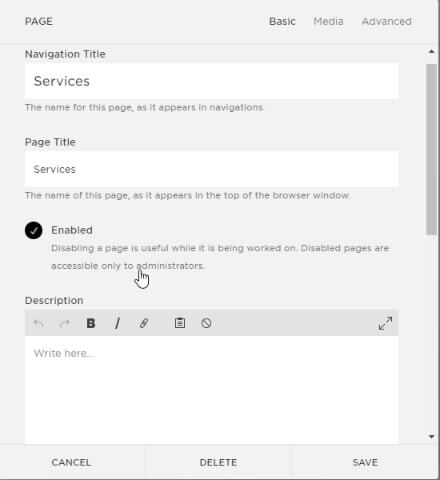 Is Squarespace Easy To Use? 3. 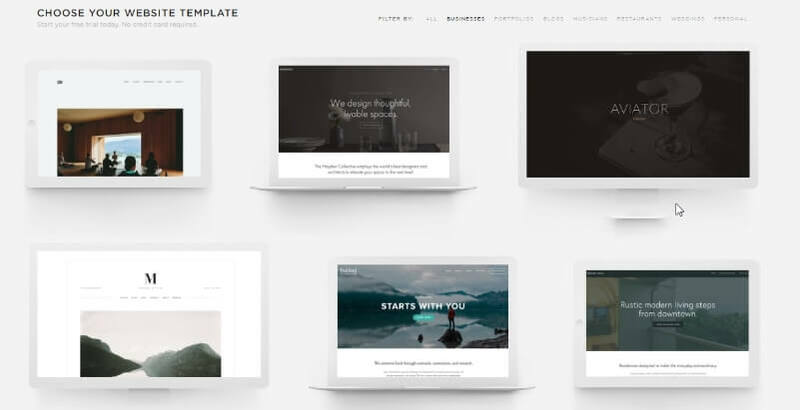 Squarespace Templates – Are They Any Good? 5. How Will Your Website Look on Mobile Devices? 6. Squarespace SEO – Will People Find You in The Search Engines? 11. 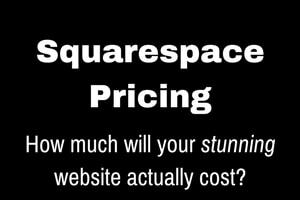 Pricing – How Much Does Squarespace Cost? 13. What Do Others Think About Squarespace? I always leave this section until after I’ve completed my review because at that point, I have a much better idea of who can benefit from the platform. Artistic types who wish to showcase their work online. It would definitely be an advantage if you have large, quality images to upload to your website as the templates are very visual (more on that later). Failing that, you can always use their partnered image site where you can purchase them, or you can bring your own from another source. I have a tendency to jump straight into a new website building platform and start creating my site before reading any tutorials or walkthroughs. This gives me a good sense of how easy (or difficult) the platform really is. The first thing that jumped out at me is the fact I was unable to simply drag and drop images and text to wherever I wanted on the page. It definitely took me a little longer to find my way around than with some of the other industry big guns such as Weebly and Wix. However, after about 40 minutes I found my feet and felt pretty confident adding/editing text and uploading my own images which can be done by simply clicking on that particular element of your site. Things really started progressing when I discovered the main menu which pops up on the left-hand side of the screen where you’ll find all of your options. Once I got to grips with this, creating my site was a lot less daunting and dare I say it, an enjoyable experience! In fact, I felt like I had much more control of over my site than many of the other website builders out there. A little advice: Watch the walkthrough videos before getting started and you’ll have a much easier time than I did. When I first started creating my site, I was a little disappointed to find there weren’t quite as many templates to choose from as I’d hoped. However, the disappointment soon melted away when I realized just how visually stunning they were. In fact, I’d go as far as to say that they’re the closest thing to having a professional designer create your site for you in comparison to the other do-it-yourself website builders on the market. I chose the “Handyman” theme from the professional services category and my finished website is almost completely unrecognizable from the original template. So, if you’re a small business owner, a blogger, restaurant, musician, or a photographer (the list continues), spend some time adding your own written content along with images and you can make just about any of the templates your own. Every business is different and you will no doubt have a very specific set of goals in mind for your shiny new site. The good news is, Squarespace makes it easy to add a wide variety of features to your site by adding “Blocks”. You can add blocks by clicking on a particular page and clicking the “add blocks” button and you’ll be presented with a list to choose from. Basic blocks (adds text, audio, video etc). Gallery blocks (adds slideshows or image galleries etc). 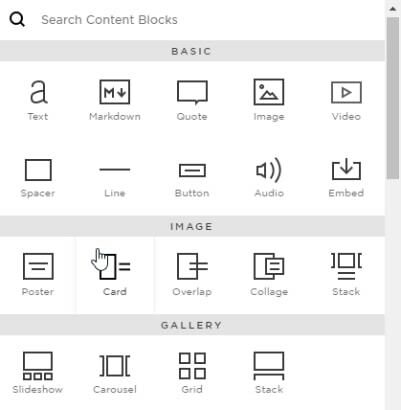 Chart blocks ( adds pie, line, or bar charts etc). More blocks (adds calendars, contact forms, booking reservations, newsletters, menus etc). Commerce blocks (add product images and descriptions to your page). Social blocks (allows visitors to connect with you through your social accounts). I should point out that some of these features were created by third-party companies and may incur a separate charge. 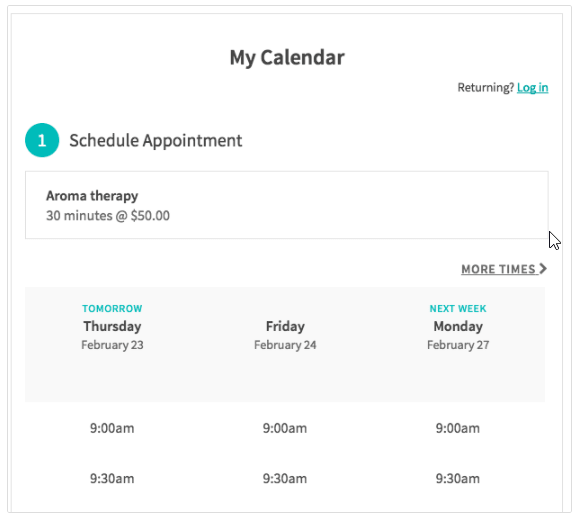 For example, I wanted to add a booking form to my site that would allow visitors to schedule their own appointments on a calendar. To do this, I had to sign up to the service and chose a diluted free version. I also had the option of upgrading to add more options and customizability. The first thing I did after creating my site was to check how it looked and performed on mobile devices such as tablets and smartphones. This is crucial these days as more people are using these devices to search the web and make purchases online. I’m pleased to say that my site looked great and functioned normally without any extra effort on my part. I was also able to add a call-to-action bar on the bottom of my mobile site that would allow customers to view my business hours and simply click and directly from their phone. 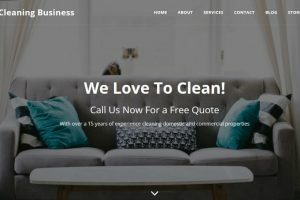 This would be a huge advantage if I were a real cleaning business and would undoubtedly result in higher conversions. It’s beyond the scope of this review to teach you how to get your website to pop up on the first page of Google but there are a few things basic things you can do to give yourself a fighting chance. These things include naming your pages, URL’s, and images correctly, and then adding a description of each page. These techniques are often referred to as Search Engine Optimization (SEO) and help the search engines understand what your website is about. Confused? Don’t worry, Squarespace has a bunch of articles and a video that’ll walk you through the process of optimizing your site. If you require your clients to be able to schedule appointments, make reservations and make payments through your website, the good news is, it’s entirely possible. However, Squarespace doesn’t have an in-house solution for doing so at this time and instead, allows you to do so using third-party integrations. While that may sound complicated, it really isn’t. Squarespace has made the process as seamless as possible by adding these integrations into their “blocks” that we talked about earlier. For online bookings, they recommend the “Acuity” block and for restaurant reservations the “Opentable” block. They even have walkthroughs showing you how to sign up and add them to your website. The downside to these third-party applications is that they come with a monthly fee in addition to your Squarespace plan. It’s not the end of the world but definitely something to be aware of. Great news if you’re intending to sell physical/digital products or even a service as you can add a store to your existing site or create a full-blown online store right out of the gate. You don’t even have to be a paying member to benefit from the eCommerce features, but there will be restrictions which will be unlocked depending on which plan you choose. No restriction on the number of products. 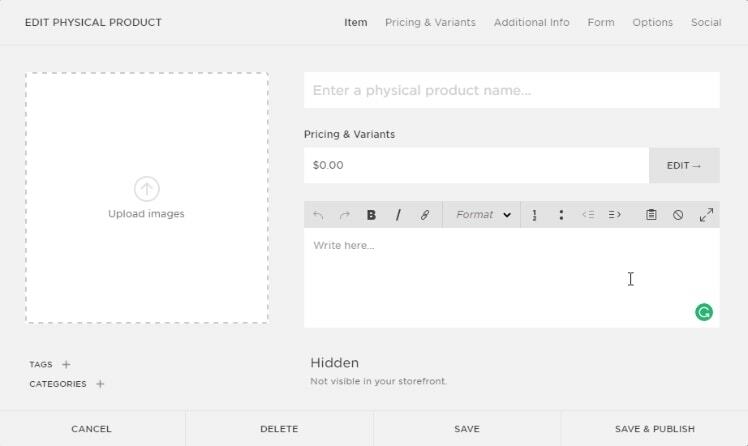 Create multiple variants of a product such as size and color. Set tax and shipping costs. Accept payments via Major credit cards and Paypal. I know many people personally, that choose a particular website builder initially and then further down the road wish they had taken the time to learn a more advanced and flexible platform such as WordPress. Should you find yourself in this position, you’ll be able to export your website over to WordPress and take much of your content over with you (not everything) and Squarespace themselves even provide a guide showing you how. Squarespace themselves even provide a guide showing you exactly how to do it. 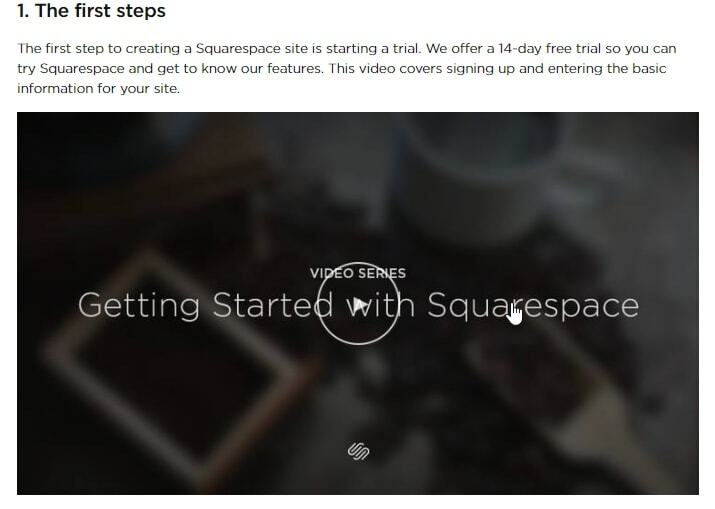 If you find yourself needing help from getting started, to adding a product to your site, you can bet your bottom dollar that Squarespace has a video or written tutorial tucked away in their knowledge base that’ll walk you through the process step-by-step. What if your site breaks or you need help with something but you can’t find it covered in the knowledge base? If it was me, my first port of call would be to head over to the community support forum and ask my question there. A word of warning; It might not be the best way to obtain support if you’re in a rush. I went onto the forum and was quite surprised to see a number of questions still unanswered 20 hours after being submitted. When using the forum, it may be worth searching through the previously asked questions first as you’ll probably find that someone’s asked the same question before, this will save you waiting around for an answer. If you need an answer quickly and you can’t wait around a whole day for a reply on the forum, then I highly recommend going directly to the Squarespace dedicated customers support team via live chat or by submitting a ticket. I have to say, these guys are fantastic! I submitted a support ticket and a friendly, very knowledgeable member of staff replied to my query within an hour and answered my question in depth. I’m happy to say that Squarespace takes their customer support very seriously which should help you sleep a little easier at night. 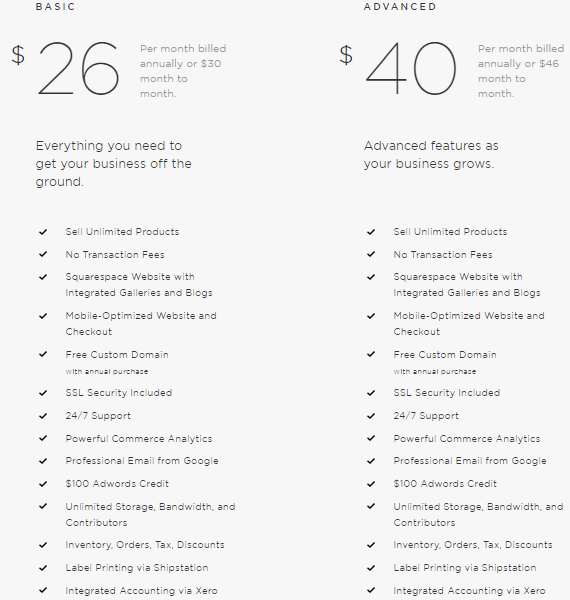 Squarespace doesn’t offer an unlimited free website option like most of the other platforms out there. Instead, you’ll be given a 14-day free trial to test things out with the option of an additional 7 days if required. I know some people may be put off by this but please remember, even though some website builders offer you a free site, their real aim is to have you sign up to a premium plan. After all, they’re a business and the aim of any business is to make money. With that in mind, once your trial ends, you’ll need to upgrade to one of their paid plans to continue with your site and make it publically live. (Your site may be deleted after 30 days if you don’t upgrade). Prices shown are in US dollars. If you’re from outside the US, you can view prices and plan breakdowns here for your region. Personal Plan: $12 per month billed annually or $16 monthly – Good option for those creating a fairly simple website and maybe selling a few products. Business Plan: If you’re going to need a business email address you may as well go for the Business plan as this is included in the package. You’ll also have fewer limitations on your account and a slightly lower transaction fee of you’re selling products. eCommerce Plans: If you intend to create a full-blown online store then you may want to consider the Basic Plan first. You can always upgrade down the road if you need to. Steeper learning curve: Due to the plethora of customization options, Squarespace takes a while longer to master than some of the other options out there. If you don’t have the time or inclination to master Squarespace, here are a few alternatives that may suit you better. No free website option: Personally, when a website builder offers a “free website” option, I see it as a way to test it out before deciding whether to commit financially so it’s not really a drawback. Besides, they do offer a 14-day free trial. However, I know many people out there only require the functionality of a free website for various reasons and if you fall into that category, unfortunately, Squarespace isn’t for you. 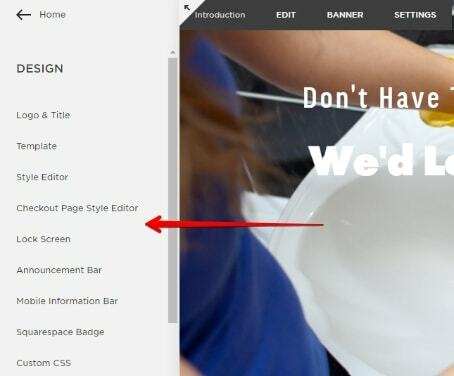 Wix and Weebly both offer a free website with restricted features and advertising. Here on Website Builder Wars, Squarespace achieved a 4.5 out of 5 rating. After scouring the web, Squarespace appears to consistently achieve 3, 4, and 5-star ratings from professional review sites. When it comes reviews from Squarespace users who are “in the trenches”, people liked the modern templates, customizability, the ability to easily add a store, support team, and the fact you don’t have to worry about the technical side of website building as Squarespace take care of that for you. I’m yet to come across any website builder that’s perfect and Squarespace is no exception. I did notice a split in the reviews with some people being completely new to website creation and others who are designers or have experience with other platforms such as WordPress. People who are relatively new to do-it-yourself platforms mentioned the steeper learning curve as I did in this review. Others wanted more in-depth tutorials to help you set up your site correctly for SEO (to get found in the search engines), while some users thought that Squarespace was a little pricey as costs can quickly add up. Many of the more experienced users seemed a little frustrated as the templates can be fairly static and it can be fairly limiting when it comes to adding custom code. I really like Squarespace. It’s easy to see why it’s one of the leading website builders on the market thanks to the ease of use, beautiful customizable templates, eCommerce tools and fantastic support platform. In fact, Squarespace is quickly becoming one of my personal favorites and believe it should definitely be on your short list to try when you’re ready to create your website. Confused about anything we’ve covered here? Do you have more questions about Squarespace or website building in general? If so, fire away in the comments section below and I’ll get back to you as soon as I possibly can! next post: Webnode Review – A Good Fit For Your Business or Project?